WorldWide Telescope is an incredible program that puts the universe at your fingertips. 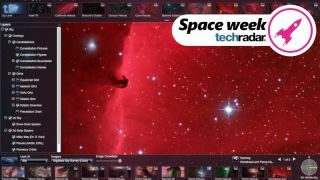 It was created using images and information gathered by telescopes probes and satellites, which are combined to create an interactive view of the sky that you can explore from your desktop. WorldWide Telescope was developed by Microsoft Research – a branch of the company dedicated to furthering state-of-the-art computing and solving real-world problems. Astronomers use WorldWide Telescope to see the universe in many different wavelengths (including visible light, infra-red and gamma radiation), and there’s access to much more data via the Astrophysics Data System. WorldWide Telescope already has more than a million active users, so let’s join them and turn our eyes to the heavens. WorldWide Telescope is available as an HTML5 web app and a downloadable Windows application. We’ll start with the web version at www.worldwidetelescope.org. To use Microsoft WorldWide Telescope, scroll past the welcome video and click ‘Explore WWT on the web’. A message will appear asking whether you want to share your location. This is optional, but telling WWT where you are will let you explore the sky as you’d see it from outside your own front door. Read the notes explaining how to navigate, then click ‘Close’. WorldWide Telescope will present you with an image of the sky with constellations highlighted. Try clicking and dragging to pan around. You’ll see the list of celestial objects at the bottom of the screen change as you move around. Select one to explore it in more detail. Here we’ve chosen Mercury. You can click and drag to spin the planet, and use your mouse wheel to zoom. The amount of detail visible is incredible. Now let’s use Microsoft WorldWide Telescope to take a look at a constellation. Click ‘Constellations’ in the top left, then pick one from the menu. Here we’ve chosen Ursa Major. Make sure ‘Sky’ is selected under ‘Look at’, then right-click one of the constellation’s stars to learn more about it. Click ‘View object’ and the display will zoom right in to show you the star up close. You can also see research papers on the star, look it up online, and more. Use your mouse wheel to zoom out again. Now you can try exploring Microsoft WorldWide Telescope on your own. Pan around and find a patch of sky that you’d like to explore and zoom in. Right-click when you see something interesting and zoom in for a closer look. Here we've found a spherical collection of stars called NCGC 6752. It’s visible from Earth, so we could use the right ascension and declination provided to find it with a real telescope. You can explore the sky using various surveys listed in Microsoft WorldWide Telescope's top menu. Zoom out again and try clicking ‘SDF dust map’. Cosmic dust used to be an annoyance to astronomers because it obscured the objects they were trying to see, but with infrared astronomy it can give us a huge amount of information about the formation and lifecycles of stars and planets. See if you can find a nebula made by a dying star. Thousands of astronomers have collaborated to make Microsoft WorldWide Telescope such an extraordinary tool, and several have put together virtual tours of celestial objects and events. Select ‘Guided tours’ from the top menu, then choose a tour and click the ‘Play’ button. You can pause the tour at any time, or right-click anything that looks interesting to take a closer look and learn more about it. You can do even more with the WorldWide Telescope desktop application, which is free to download. We recommend enabling the option that checks for automatic updates each time you start the program. While you’re using Microsoft WorldWide Telescope, take a moment to visit Earth. Here you can choose from several views (the Earth at Night options are particularly impressive) from different years. You can zoom right in to find your house, then move all the way out and begin exploring different galaxies again. Microsoft WorldWide Telescope an amazing tool that makes you feel very powerful, but also very, very small, and it will keep you clicking, zooming and reading for days.